So What is an XA, XB, or XC Falcon? This is what I had to learn myself. 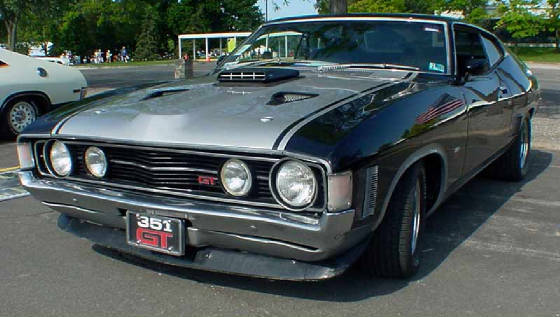 Being an American I had never heard of them before I discovered that Max's car was made from a 1973 Ford XB Falcon GT. In the US the Ford Falcon had been discontinued after 1971 when the Falcon was merely a Torino with a certain option package. Interestingly it was this Torino that caused the birth of the Australian Falcon into the incarnation of the XA - XC bodies. In Australia the body style generations are distinguished by the dual-Alpha designation. The XA Falcons were produced in 1972 and 1973 and were then followed by the XB Falcons in 1973 to 1976 when the XC Falcons were introduced and produced from 1976 to 1979. I am only going to cover the coupes first. At the end of the section will be information on sedans. Previous to the XA Falcon the Falcons in Australia looked almost just like the Falcons in the US throughout the 1960's. Then Ford prepared to market the Torino in Australia as the new Falcon. However, Ford of Australia, knowing their market well, knew that this car was not going to do well if it was to be built and offered to the public. Engineers from Australia went to Ford in Dearborn, Michigan to see what all the latest technology was in automotive design at Ford since Australia did not have their own design department. After this trip the Engineers went to work once they returned to Australia to design their own Falcon. The XA Falcon was the result of this effort and the design was sent to Dearborn. There the company was so impressed by the design it was approved and Ford of Australia was told to manufacture the car. This also caused Ford to grant Australia their own design department that continues to design the Falcon to this day as it has proven itself to be one of Australia's premier road cars. The front end had the wide opening similar to the earliest Torino and the hood was also similar. The roofline and quarter panels, as well as the back end, had hints of early 1970's Torinos, but only "hints". This car was about one and a half foot shorter than the Torino and certainly a lot sexier. The scoops in the front fenders were certainly unique to the XA Falcon. The car in the picture above belongs to Tom Nuss of Pennsylvania. Tom's car is an XA Falcon GT clone. He started out with a very rough car, as he was to discover, and made it into an absolutely beautiful machine. The car started out as a Falcon 500 and Tom installed all the factory GT components from a donor car. For all intents and purposes his car is a Falcon GT. Only his VIN plate gives away it's origin. I've seen his car in person and it is what people dream of owning. Here are some of the pages from Tom's website where you can find all kinds of information on his car, Australian Falcons, differences between the Torino, Aussie Falcon, and Mustang, and much more info! Thanks a lot Tom!